The Department of Marine Resources won't be using researchers' model to make management decisions, saying that forecasting fishery populations 30 years out is extremely difficult. The state agency that oversees Maine’s marine fisheries is questioning the reliability of a new study that predicts a sharp decline in Gulf of Maine lobsters over the next 30 years. The Gulf of Maine Research Institute, the University of Maine and the National Oceanic and Atmospheric Administration built a computer model that predicts the population will fall 40 to 62 percent by 2030. But Patrick Keliher, commissioner of the Department of Marine Resources, won’t be using the model to help him decide how to manage the state’s most valuable fishery, which pumped $533.1 million into the state economy in 2016. Thirty years ago, when landings were less than 20 million pounds, no one could have predicted that the Maine lobster fleet would be landing more than 130 million pounds a year in 2016, Nichols said. “The commissioner and his science staff don’t question the science, but rather see this as an unreliable tool on which to base management decisions,” he said. The department isn’t alone in having doubts about the study. Maine lobster dealers voiced skepticism, too, recalling previous erroneous lobster forecasts by some of the same scientific organizations. Dealers discounted the study as one more irresponsible, arrogant prediction in a long line of wild guesses that is only as good, or in this case as bad, as the model’s initial assumptions. Maine Lobster Dealers Association Director Annie Tselikis said the Gulf of Maine Research Institute, a nonprofit based in Portland, had made inaccurate molt forecasts that had spooked buyers and hurt the industry. She noted the 2016 molt forecast was issued days before the Seafood Expo North America in Boston, the largest annual lobster trade show of the year. The publicity definitely hurt sales, she said. But the institute disputes Tselikis’ claim, saying its molt predictions were accurate. When the industry pushed back, saying they didn’t need or want them, the nonprofit decided to stop publishing them. The institute questioned the ability of lobster dealers to assess the validity of the science or years of sea temperature, predation, shell disease and population data used to generate its 30-year forecast. The Gulf of Maine Research Institute isn’t the first to link ocean warming to lobster abundance. In 2012, Rutgers University documented the link. In 2015, Rick Wahle of University of Maine tied shrinking larval habitats to warming. While Wahle’s 2015 study found the number of baby lobsters on the decline, the Department of Marine Resources’ survey and sampling programs that capture population data for older lobsters found no corresponding decline. Landings in 2016 broke volume and value records. But it takes seven years for lobsters to grow big enough to be legally landed, so the impact of warming waters has yet to be felt at the dock, Wahle said. He worked on the long-term forecast, too, and acknowledged that scientists have struggled to make accurate fishery predictions in the past, but that doesn’t mean they should stop trying. Wahle said a key goal of science is to be able to use all the tools at your disposal to analyze as much data as you can collect to predict the behavior of the thing that you are studying. There are still variables that have yet to be calculated and factored into the model that could change the forecast, like acidification and the ability of a lobster population to adapt to changes. The intent wasn’t to predict a doomsday scenario, Wahle said. In fact, the forecast shows that in 30 years, the size of the population will likely return to the size it was about 10 years ago. 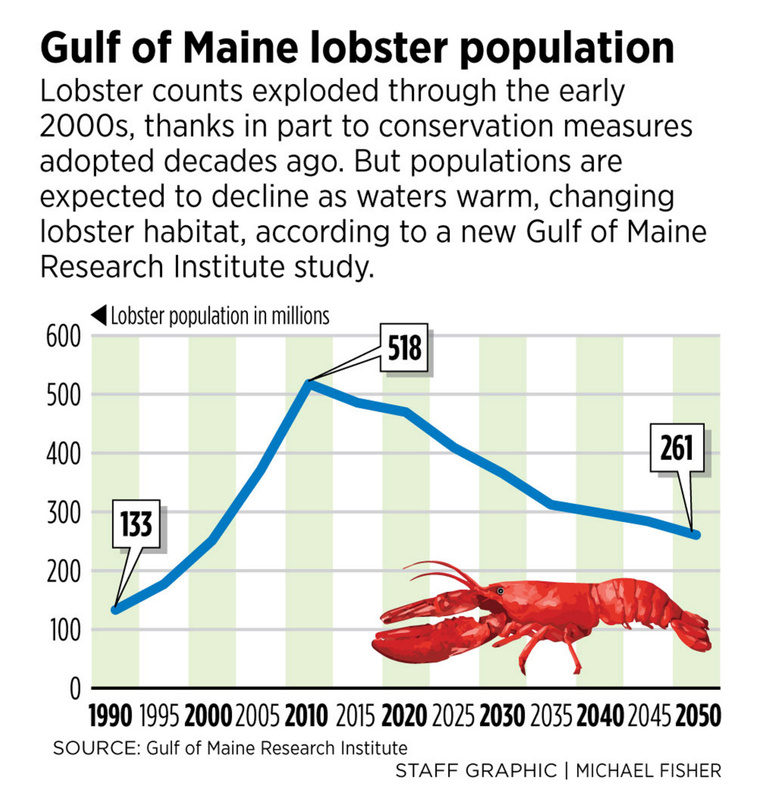 In 2014, when study authors think it peaked, interstate regulators estimate the size of the Gulf of Maine lobster population at about 270 million lobsters. Fishermen landed 126 million pounds that year. Even based on its mildest warming scenario, that population would shrink by 108 million, to 162 million lobsters, with a 40 percent cut. The warmer scenario would shrink it by another 59,000 lobsters. At first glance, the long-term forecast may look like a stretch, but the same model successfully used old temperature, predator and disease data to calculate populations that matched data from past years. Scientists owe it to the Maine lobstermen, who face short-term fishing decisions and long-term investment decisions on a daily basis, to share their predictions, Pershing said. “The results of our study may not be what some people want to hear, but we have an obligation as scientists to share what we have learned, even if it is unpopular,” Pershing said. The study concluded conservation measures such as throwing big lobsters and egg-bearing females back had fueled Maine’s recent lobster boom, and will likely mitigate its forecasted decline. While the Department of Marine Resources may have no plans to use the study’s forecasting tool, it is trying to up its own science efforts. It is establishing a lobster research collaborative that will fund $500,000 in lobster science projects. The collaborative will be made up of a variety of institutions with a range of expertise with a goal of addressing the impact of the changing ocean environment on Maine’s lobster fishery, Nichols said. “We know that the current abundance is likely to change at some point,” Nichols said when fielding a reporter’s questions about the collaborative’s pending effort last month. The department also is in the process of hiring a new senior lobster scientist to provide additional research capacity that will complement and support the collaborative’s work, Nichols said. That is on top of the $700,000 it will spend in fiscal year 2018 to fund and staff its lobster monitoring programs, and a $490,000 federal grant for a biannual trawl survey of lobster and other species. Last year, Keliher asked interstate managers to standardize lobster management rules, like maximum size limits and v-notching females, to improve the spawning ability and resiliency of the stock. “The department is committed to proactively obtaining a better understanding of lobster habitat, improving assessment and monitoring and taking into consideration the economic and social impact of management measures,” Nichols said.